Cabriolet, polka dot poodle skirts, ribbons, cat eye sunglasses, leather jacket and hair grease: here you have the perfect 50s' look! During the Festival, the vintage accessories' English brand GPO will liven up the seaside town: on August 3 rd ,4 th and 5 th and 10 th , 11 th and 12 th , from noon to midnight, GPO team will walk along the beachfront and the area of "Rotonda sul Mare" to show its products to the modern Danny Zukos and new pin-ups to let everybody feel the irresistible desire to "twist and shout". Festival's guests could test GPO Ambassador, the portable record player with Bluetooth connectivity that plays 33, 45 and 78 speed records. It also lets you record your vinyl on a USB stick. The vintage style of GPO goes back also to the 80s with Brooklyn, the super cool boombox that gives new life to the Ghetto Blaster, perfect to be carried on your shoulder. Brooklyn by GPO will make some noise on the Senigallia beach to thrill the new urban generation with its CDs and tapes! Many more surprises are waiting for you in Senigallia! 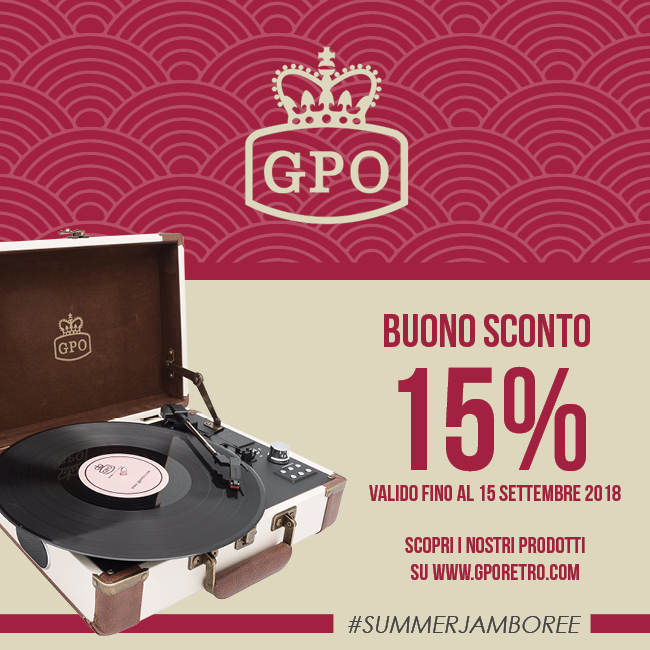 GPO Boys & Girls will give to the guests a 15% off coupon to buy a GPO product on www.facethesound.com or in the selected stores* until September, 15 th . Last but not least, those who will leave their contacts to keep always informed about the latest news from GPO, will receive a GPO bag! 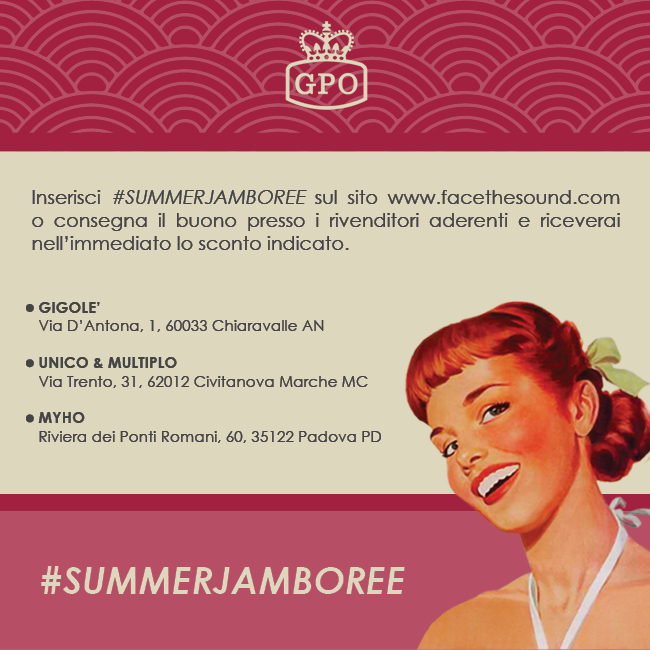 Find the GPO's team at SUMMER JAMBOREE, dance on the beat of lindy hop and dive into the vintage atmosphere! The GPO (General Post Office) was created by Oliver Cromwell's Parliament in 1657, which declared: 'There shall be one General Post Office and one officer styled the Postmaster-General of England.' However, Charles II recognised none of Cromwell's laws so issued a very similar act in 1660, which confirmed the formation of The Post Office. The law made the GPO the sole carrier of post in the UK and forbade all competition. In 1870 GPO took control of Britain's telegraph network and assumed complete control of the telephone network in 1912. From then on the GPO was monopoly supplier of both the telephone and telegraph networks until 1982, when the first carrier was licensed in competition with the new British Telecom (successor to Post Office Telecommunications). The original GPO Telephones were produced by the General Post Office in the UK from the advent of the telephone in the mid-19th century, right up to the late 20th Century whilst the telephone network was still a publicly run service. Within that one hundred and fifty year period the GPO released a huge amount of memorable and sturdy phones designed for everyday use which were eventually discontinued as the company was turned into a private corporation in the 1980s and technology moved on to satisfy a demand for cheaper products.